Ancient coins provide us with a palpable link to a specific time and place in history. Their wondrous, diverse iconography frequently epitomizes the setting in which they were struck. More than a means for exchanging goods and services, they publicized - and even influenced – the very course of ancient history. A notable example is this famous denarius, struck by Julius Caesar soon after he triggered the Great Roman Civil War. Caesar probably struck this marvel of self-promotion in mid 49 BC, a crossroads in ancient history. Caesar had recently led his troops across the Rubicon, and arrived in a Rome deserted by his political enemies. He addressed the remaining Senators, and, with his growing political power and extraordinary charisma, managed to procure vast quantities of public precious metals. This silver and gold was used for striking coins, such as this so-called elephant denarius, the first coin directly attested to the Caesarian side during the civil war. These coins were struck by Caesar’s military mint in the millions - without formal Senate approval – to advertise both his own achievements and the shortcomings of his opponents. 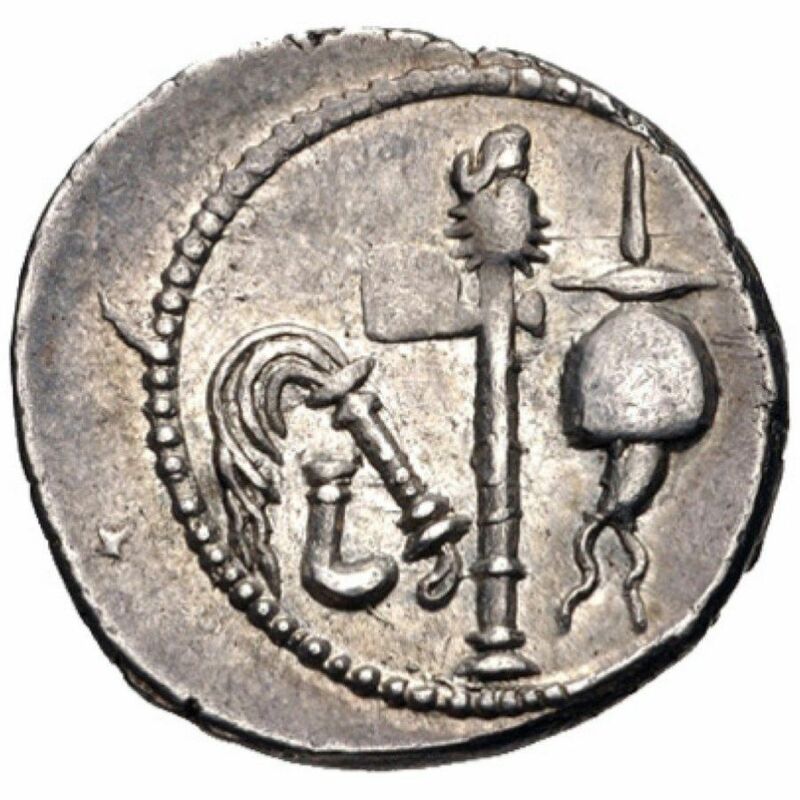 The obverse depicts religious implements associated with Caesar’s office of Pontifex Maximus: a culullus (a ritual cap), an aspergillum (a brush used to sprinkle holy water), a securis (a single-bladed, double-handed, and animal-headed axe), and a simpulum (a long-handled ladle used at sacrifices, for example to share libations). These religious symbols emphasize Caesar’s religious post as well as provide a reminder of his claimed relationship with the gods, such as Venus. The verso portrays an elephant facing right, with its trunk defiantly raised upwards, about to trample what appears to be a horned serpent, and, in exergue, the simple, yet striking, legend of CAESAR. 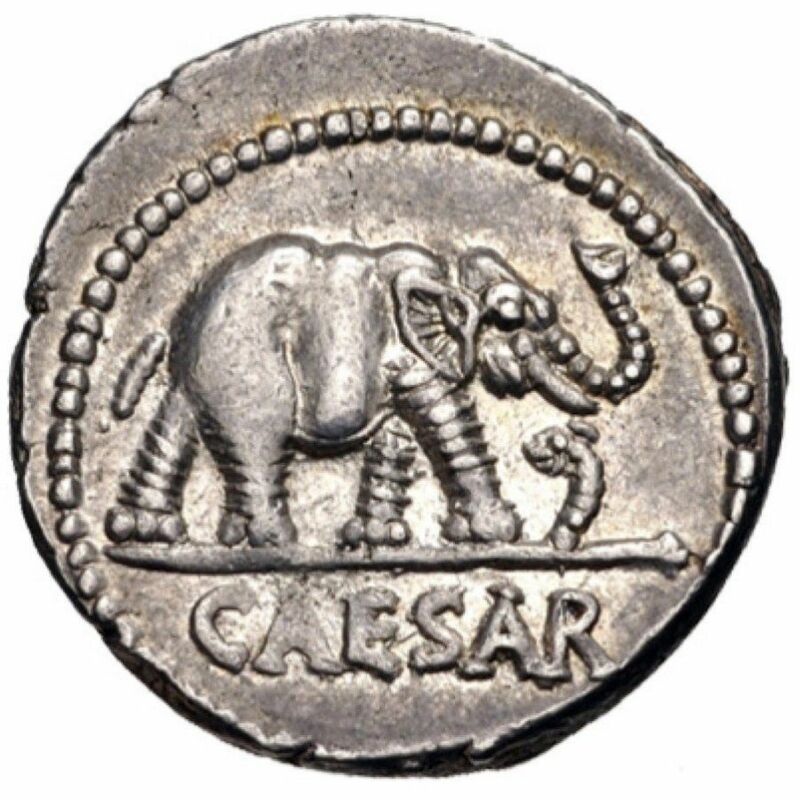 This extraordinary imagery (the only instance Caesar employed an elephant) still draws attention today, the subject of intense debate among historians and numismatists alike. Interpretations range from a representation of good over evil to a play on the Punic term for pachyderm. However, the most satisfying explanation involves Caesar’s clever attack against his political opponents, notably Gnaeus Pompeius Magnus, also known as Pompey the Great. The elephant motif as a numismatic device was employed on earlier Roman and Hellenistic coinage. Importantly, the large and powerful elephant had become associated with Alexander the Great, even though the Macedonian marauder did not actually employ them in battle. It was no coincidence that Pompey, wishing his reputation to be comparable to Alexander’s, encouraged his own association with elephants. 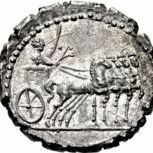 During his first Triumph in 81 BC the great imperator attempted to impress the populace by driving his elephant-drawn chariot through Rome’s gates. Unfortunately for Pompey, the entrance was not large enough, forcing the chagrined hero to improvise a more mundane entrance. Pompey also employed elephants in the extravagant games for his theatre’s opening in 55 BC. Embarrassingly, the scene rallied the crowds’ sympathies against Pompey. If anything, Pompey had earned embarrassment for his attempts to exploit elephants. Of course, Caesar knew this, as he strove to promote himself above his ally-turned-enemy. Therefore, it is not unreasonable to theorize that Caesar’s elephant denarius was intended to mock Pompey. Regarding the snake, explanatory theories abound, including those positing an allegorical battle between good and evil. Interestingly, some Romans considered the snake and elephant as natural enemies. For instance, Pliny the Elder recounted their perpetual discordia in a tale of battle wherein the snake eventually kills the elephant, only to be crushed under the weight of its falling foe. While impossible to divine Caesar’s true intent, the possibility remains that Caesar was invoking the ancient rivalry between the two animals, presumably identifying himself with the elephant, whose figure dominates the coin’s flan. Intriguingly, the coin depicts the very moment before engagement; the final outcome of bestial battle, just like the Great Roman Civil War itself, is to be determined. Caesar’s ultimate fate, famously murdered by enemies nervous of his powers, parallels Pliny’s outcome for the serpent, rather than the elephant. Additional Reading: “Turning Points in Roman History: The Case of Caesar’s Elephant Denarius,” D. L. Nousek, Phoenix, 2008, 62:290-307. Coin Details: ROMAN IMPERATORIAL, Julius Caesar, April-August 49 BC, AR Denarius (19mm, 3.87 g, 3h), Military mint traveling with Caesar, NGC Grade: Ch AU*, Strike: 5/5, Surface: 5/5, Obverse: Elephant advancing right, trampling on horned serpent, CAESAR, Reverse: Emblems of the pontificate (simpulum, aspergillum, securis, and culullus), References: Crawford 443/1; CRI 9; Sydenham 1006; RSC 49. Very well done journal entry. Quite informative, and an interesting read. Just Bob - Thanks for the feedback, I really appreciate it, and this particular coin is one of my favorites! I can see why it is a favorite. I don't own any ancients. But so sometimes I see one that really hits me as special, and this is one. Is the CAESAR across the obverse a common feature? Yes, I think what you describe is what really stands out to me. Just the CAESAR. Very cool coin. Thanks for sharing! just beautiful and nice write up! !